Bloomsbury USA Childrens, 9781619633988, 392pp. Millions of people witnessed Emma Taylor's first kiss-a kiss that needed twelve takes and four camera angles to get right. After spending years performing on cue, Emma can't help but wonder if any part of her life is real anymore . . . particularly her romances. She's been burned by heartthrobs (and the press) one too many times, but there's something about Emma's co-star on her new TV show Coyote Hills that is irresistible. Jake Elliott is gorgeous, smart and actually cares about Emma's charitable foundation. But she's sworn off on-set relationships. They always end badly . . . don't they? AMY FINNEGAN writes her own stories because she enjoys falling in love over and over again, and thinks everyone deserves a happy ending. She likes to travel the world-usually to locations where her favorite books take place-and owes her unquenchable thirst for reading to Jane Austen and J.K. Rowling. Not in the Script came about after hearing several years of behind-the-scenes stories from her industry veteran brother. She's also been lucky enough to visit dozens of film sets and sit in on major productions such as Parks and Recreation and Parenthood. 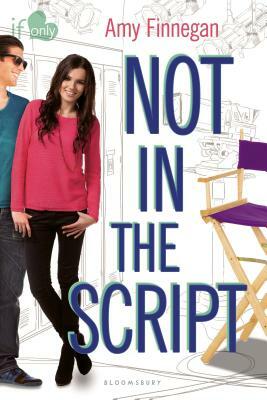 This is Amy's debut novel.